Tips for Easier DIY When You Work by Yourself | 41 Lumber - Serving Iron Mountain and the U.P. 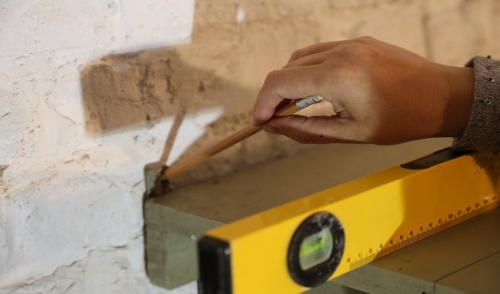 For the most part, many home improvement DIY projects can be accomplished solo. For many people, there is a lot of satisfaction and peace of mind from being able to lose yourself in a project; knowing that you did it all by yourself. There are, however, times when you could just use an extra hand. Luckily, we’re here to tell you that it’s possible to have that extra helping hand and still do the project solo. First let’s talk safety. If safety is a factor, there is no shame and looking for help. Some jobs just are too risky to be tackled by yourself. That being said, there are still other ways to make your solo job even safer. In most cases, scaffolding can be safer than ladders. When working alone, many are tempted to carry as much up the ladder as possible, since no one is there to hand things up. With scaffolding, you’re able to bring the things up that you need and you’ll be able to more safely reach a wide area without over extending yourself and loosing balance. When moving heavy objects, there’s no need to hurt your back. An appliance dolly can make moving large bulky items a lot easier and safer. Likewise, for objects that are too heavy to lift into a wheelbarrow, simply tip the wheelbarrow down, roll the object in and tip the wheelbarrow back up. A panel-lift can be the safest way to hang drywall on the ceiling. For holding and installing objects above the ground such as cabinets and air-conditioners, an adjustable extension pole can keep it right where you need it. Clamps. Lots of clamps. C-clamps and spring clamps can be helpful, but the most useful are probably bar clamps. They have a wide range of movement and can be tightened or released with one hand. Having these in your arsenal can be invaluable for a solo DIYer. They can hold a board in place for cutting or nailing, hold a pipe in place for soldering and countless other uses. Make a support rig or “cleat” out of a scrap of wood in order to hold the other end of a long workpiece in place. This works well with joists, siding, and with shelves. Having a premeasured piece of wood can be quite handy. This “measuring stick” can be useful in jobs where you would normally extend a measuring tape and it would collapse because the gap is too wide. A premeasured stick of 4 feet or 8 feet can help narrow the gap. Sometimes, when circuit breakers are not clearly marked, it can mean far too many trips up and down the stairs before you find the right breaker. Try plugging a radio into the outlet you wish to disable. That way, when the music stops you found the right breaker. One of the most useful “helpers” for the solo DIY’er is the trusty toolbelt. There’s nothing like having just what you need, right there at your hip.